There is need for justice for victims of online fraud who are equally oppressed by banks, because they seem so little and powerless against the huge corporate might of these banks. 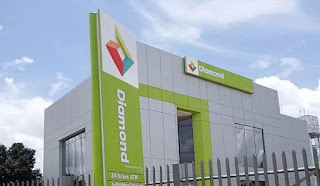 I demand for justice in relation to Diamond Bank, for all that I have laboured for, which have been unfairly taken from me through one of its services, for which it is avoiding to take responsibility. I run a micro small business called Idong Harrie. We manufacture and retail handmade footwear and accessories using genuine leather and African fabrics for men, women and children. My business has won several recognition and awards by several multinationals and is playing it’s role in impacting the Nigerian economy and we ensure we also give back to our community. A few months ago, I got shortlisted by the Mandela Washington Fellowship as one of the 101 outstanding young leaders in Nigeria to undergo a six-week training in United States (all expenses paid). I decided to go to my bank (Diamond Bank) to request for PTA for the trip. I had initially wanted to request for $400 but one of the teller guys suggested I do $3000 at once. After consideration, I decided to do just that because I had some transactions to do in China and needed to pay for these and also buy some things for my factory while in the US. She then told me to re-activate my app. I did just that and the app requested for my PIN. I typed in my PIN and it said it was invalid again. I explained this to the customer service representative who was still on the call with me and she advised that I visited the bank. I told her that it was almost 4p.m. and couldn’t make it but would do so the next day, since I still had some documents I needed to drop off at the branch, and so I ended the call. Less than five minutes after the call, I received a text message. When I checked, it was a diamond bank message showing a N100,000 transaction. I assumed it was a payment from a customer, which I was expecting. I then instructed my workers to start work on the customer’s order in the assumption that she had paid. A few seconds later, more texts came in and I saw they were still from Diamond Bank. I noticed that the texts were debit alerts and the names coming with them were strange. I said to myself that if Diamond Bank wanted to debit the money for the PTA, they won’t do so it in trenches. Immediately, it occured to me that my account had been hacked, and I called the customer service, while simulatenously rushing to the bank. I got through to customer care and instructed them to block my account. I was at the bank when the debit alerts of the money being withdrawn were buzzing as they came in, while literally screaming at the customer service lady that all my money was gone and the account needed to be blocked right away. What I don’t understand is why the bank isn’t thoroughly investigating the issue. I don’t have an ATM card to that account, my cheque book was locked up safe and my token was with me. The monies were transferred to people’s bank accounts. I have all their names on my bank statement. What is then the essence of the Biometric Verification Number (BVN)? I had a radio interview on October 20, 2017 concerning this issue with Mrs. Sola Salako on her online radio station. We also talked about one elderly woman’s case with the same Diamond Bank. All her pension money of N585,000 was fraudulently withdrawn via mobile banking, leaving her with N2.07. The woman uses an analogy phone, so how on earth could she have done mobile banking as stated on her bank statement? The next day after this incident, her husband died. Now the woman is mourning the loss of her husband and her money and yet since March, the bank still hasn’t refunded her money. How heartless could this be?!!! Just about three weeks ago, I decided to wake up from my depression. I got myself back after the consistent advice and encouragement from my dear friends and few customers who were aware of the unfortunate incidence. I recalled that I was at a forum held by EDC some years back and Mrs Tope of Sixth Sense was on the panel. She told the story of how her store burnt down and she had to start all over again. I decided to read The Girl Entrepreneur by Mrs. Ibukun Awosika again to motivate myself. Reading about how most of the women we look up to today went through challenges in their businesses. How Mrs Ibukun fought when policies changed which affected her business but she still rose ahead; how Mrs Tara felt on seeing imitation of her products in China – her sweat and labour of many years, but is still going on till date; then who am I not to rise up from my depression and keep going on! Even though I do not know where the next money will come from to pay salaries and other expenses to run my business and personal life, I know that I have a God and He is my Jehovah El-Shaddai. He is the one who fights my battles and delivers me from the claws of devil. After all, He is GOD! My dear friends, please be very alert. I still don’t know what I did wrong to make this happen, but just be cautious. There are a few tips on how to secure your accounts on this website www.cafon.org.ng. Please read them and share. At this juncture, I would appreciate anyone who has ideas on how SMEs like mine can be saved from total collapse after going through such a massive shock and setback. I believe that I am one of many who have been affected by these acts of fraud, of which the banks around and policies in place do not help but are disdainful of victims. It is highly unfortunate that honest people work and yet scammers live off the fruits of the labour of such people. Equally, the business policies in place across both the private and public sectors need to be re-evaluated to cater for victims. Banks are insured from things like this and I guess that’s probably why they don’t care about others. Hence, victims are left to bear their burdens and go through the nights of depression alone. There is need for justice for victims of online fraud who are equally oppressed by banks, because they seem so little and powerless against the huge corporate might of these banks. I demand for justice in relation to Diamond Bank, for all that I have laboured for, which have been unfairly taken from me through one of its services, for which it is avoiding to take responsibility. I demand justice for the shoddy and non-cooperative way in which I have been treated by the Bank this far.